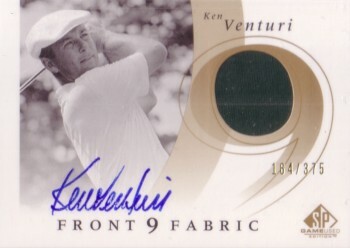 2002 Upper Deck SP Game Used Edition card with certified autograph of the late U.S. Open winner Ken Venturi also featuring a swatch of a shirt he wore in competition. #184 out of only 375 numbered cards produced. ONLY ONE AVAILABLE FOR SALE.